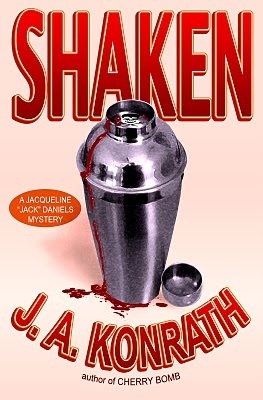 Amazon Encore the publishing imprint of the internet retailer has signed a deal with JA Konrath to publish his next ‘Jack’ Daniel title, Shaken. this is a significant jolt to conventional publishing economics. Sales of Konrath’s $2.99 ebook will deliver him about $2.10 a copy (Konrath says $2.04; not sure where the other six cents is going…), as much or more as he would make on a $14.95 paperback from a trade publisher, and significantly more than he’d make on a $9.99 ebook distributed under “Agency” terms and current major publisher royalty conventions. I noted here and elsewhere how Authors will drive change and pointed specifically to Konrath. It is very interesting that this deal is with Encore whose efforts I have also been watching warily for some time. Publishers who didn’t see this coming, having been warned that such moves were on the horizon and in the aftermath of a series of similar deals really only have themselves to blame. I wonder what the reaction will be. Print may wither much sooner than we expect! Interesting! What do you make of Lulu? They give almost twice as much to the author, although I suppose it doesn’t have great market penetration. Lulu is great for what it allows, low cost access to Print On Demand. For many authors that is an excellent way to access print without huge upfront cost. What it doesn’t offer, which Amazon does, is marketing power. All Lulu offers is a storefront. For most authors and books, that’s all Amazon offers too. Well that and the fact that they have instant brand recognition and it sounds better to say my book is on Amazon than my book is on Lulu.com. It’s only when they actually offer to promote your work that Amazon comes into its own!